On the occasion of their third birthday, Power to Change’s CEO, Vidhya Alakeson reflects on the three things she has been most proud of in the independent trust’s early years. 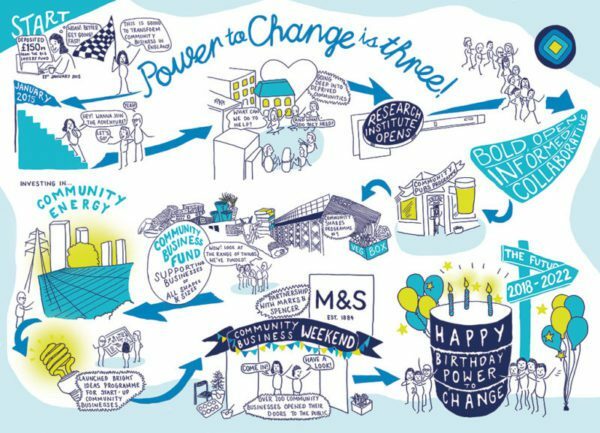 Three years ago today, on 21st January 2015, Power to Change was set up by Big Lottery Fund with a remit to create better places through community business. At that point we were just a handful of folk with a couple of laptops in a shared office. We are still just a few dozen but with offices in Bristol, London and Sheffield and over £40 million deployed across England to support over 400 community businesses, we have come a long way since those early days. Looking back over those three years, I think there are three things I am most proud of. Firstly, amongst those initial grants, I see organisations that have made a real step change in what they have been able to do in those three years. At the same time, they are well on the way to becoming self sustaining businesses, run and controlled by the members of their community. Businesses like the Anglers Rest outside Sheffield where we started out helping them to buy out the pub but where it is now the post office, café and so much more. Or the Bevy on the Moulscombe estate in Brighton, a community-owned pub that has turned around its fortunes over the last two years to now be profit-making .Finally, there’s Homebaked, the bakery in Anfield that now supplies pies to Liverpool Football Club and is re-generating the run-down high street it sits in “brick by brick and loaf by loaf”. The second thing I am most proud of are the strong partnerships Power to Change has forged across different sectors. These start in the social sector with organisations like Big Society Capital, the country’s biggest social investor and Locality, with their roots deep in some of the most challenged and enterprising communities in the country. Our partnerships extend well beyond our immediate surroundings however, through government with key figures like Marvin Rees, the Mayor of Bristol, one of the places we will be focussing our resources on, to corporates that touch nearly every community in the country like M&S and the Mirror Group. All these partnerships enable us to extend our reach and amplify our impact to create a legacy for community business that will outlive the life of our trust. Thirdly, we are using our funding in innovative ways that similar organisations to us don’t have the flexibility to do. Grants are and always will be the mainstay of what we do but that money can be used in productive ways to unlock other types of funding. For example, by match funding community share issues from housing to farming and even a pier, we can harness the engagement of the communities that these businesses sit in the midst of. Or by bringing in loan funding with social investors like Key Fund and Social and Sustainable Capital, our grant funding can go a lot further. We are even testing with the School for Social Entrepreneurs how community businesses can improve their sustainability if use our grant to match increases in their trading income. Our most recent and perhaps most innovative move is to deploy part of our endowment alongside investment from Big Society Capital to buy up solar farms that we will sell onto communities over the next three to five years. We cut our first deal in the lead-up to Christmas with the purchase of a solar farm outside Plymouth from renewable energy supplier Good Energy that will generate surpluses for the community there for many years to come. So, all in all, a busy three years. And given the interest we have generated in community business so far, things are only going to get busier for Power to Change over the next three years.